I've been Adopted! - Isabelle found a forever home threw facebook!. This little girl came in to the hospital on Friday. 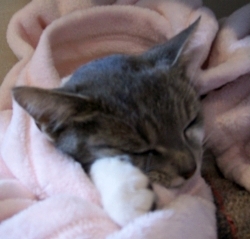 She was found by one of the our clients desperately looking for a place to keep out of the coming cold. She's settled in really well. She's a real attention getter and loves people. She's under a year old and has short hair. She's a little under weight but otherwise has a clean bill of health. 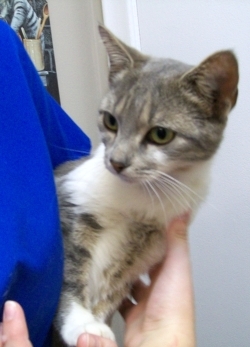 She has now been spayed so she is ready to go to a new home anytime. If you know of a place for her to have a forever home please contact The Cat Clinic. Please check out our facebook page for the most current updates. We will keep you posted on this little girls progress. One of our clients "shared" Isabella's post on facebook, her new family saw her and fell in love. Thankyou to all of our facebook clients who helped us find her a new home.